A particular wind is blowing today at more than 30 miles an hour through the farmland. Inside we can hear the wind howling through the fireplace and outside the house, the wind is audibly howling as well. The trees are bending and the electrical power lines are clacking together noisily (that’s a new one for me by the way). It’s almost a little eery like yesterday, but there’s a blue sky behind the clouds which are moving away at a fast pace. Can you see how the leaves are upturned by the wind? It’s really blowing here! On the cusp of the atmospheric changes, this wind feels like it is blowing away all the debris (quite literally) mentally, emotionally and physically in order to pave the way for the new phase in our lives. Thank goodness, right? A little while later, the sun came out and the winds have moved the clouds a bit. This is the farmland where the geese hang out! No geese today! The windy conditions helped the birds in flight! This hawk soared effortlessly for quite awhile above me. Are you having crazy winds where you live today too? How do they make you feel? I feel lifted and (pun intended) blown away by the powers that be. Grateful for the change of the season and for the gradual beneficial changes in my life. I hope you had a lovely weekend as well! Just before the eclipse was to begin, the cats remained awake, ears perked up, listening and watching the unseen. I watched as their breath was steady, but ever so slightly quickened. I wonder how they react to such a phenomena? The quiet is amazing outside. Stillness except for the whir of a car on our country road. It’s as if we are all holding our breath for the big reveal – the darkness of the moon’s passing over the sun on a summer’s day. In quiet anticipation, I await as I assume so many on our planet do at this moment. Await the experience, even though I am not in the direct line of view where I live. It is the experience of being outside with the world as darkness falls for a few precious moments and life is reset. From inside our home, I see nothing different outside as I check my watch. I still see the sunlight dappled on the ground, peeking through the leaves of the trees. I know I have to look for the crescent-shaped shadows when it’s time. I only hope I can get a photo or two to show you. The eclipse is slated to begin at 1:20pm in my area, to peak at 2:45pm and to end at 4pm. It is only 1pm and my limbs feel heavy suddenly. Is it my imagination or is it a real feeling from the Universe? Did you have any reactions as the eclipse time grew nearer? I would love to hear how you spent the eclipse time? I didn’t get glasses so I won’t be looking directly into the sun as I value my eyesight. The winds have picked up. I can see the leaves dancing on the limbs of the trees outside my window. It feels like the anticipation before Christmas morning. The sky grows dimmer. It’s now 1:18pm. It is silent except for the whispering of the wind through the trees. Even the farmer across the street has stopped his tractor in the corn fields. Outside it’s beginning to look like the darkening of the skies before a summer thunderstorm. I’m not sure why I’m so riled up about the eclipse. It feels like a giant present to the Universe for me to witness. You know, like when you’ve bought the perfect gift for a loved one and they are about to open it and you just know they’re going to be so surprised and love it? I watch a car stop across the street. A teenage boy gets out, puts on his solar eclipse glasses and looks up to the sky. Since I don’t have glasses, I wonder what he sees if anything yet? Is it too early to see a change? A friend in Los Angeles just sent this photo of the crescent-shaped shadows on concrete. Cool! No need to wear sunglasses now. Skies are darkening overhead slowly, but steadily. I await hungrily in anticipation. Do you? 2pm Cats meowing relentlessly. Do they feel it? Do you? Do your pets? What was their reactions, if any? Outside the light is fading. No sunshine to see. No shadows on the ground. Willow tree gently sways in the gentle breeze. No birds are chirping. No movement from any animals either. Are they resting? Do they think evening is here already? Clouds have darkened the sky. Only a sliver of blue remains and the sun is covered by dark clouds. Suddenly three geese burst forth honking on their way across the sky. And then all grows eerily quiet. Until the clouds part for the briefest of moments and voila! I capture the eclipse! And then again, two seconds later! I guess my Universal gift was that I was able to photograph the eclipse because of the cloud cover. However, I am dismayed that I never got a shot of the crescent-shaped shadows on the ground though. Thank goodness my friend sent me a photo earlier in the day which I shared here. It may have been the big reveal that wasn’t such a big reveal, but as you read through my two posts about my experiences, perhaps you’ll share yours. What’s the big reveal to me? I think it’s the unity in experience that counts. This is a sunrise shot from my recent flight. I love the colors of the sky as well as the gentle, yet beautiful reminder that there is always a dawn. Perhaps you will find some inspiration as I did from the photo. For every day, we can count on the dawn and dusk. Do you ever think about all we take for granted? The air we breathe, the Earth we live on, the homes and food we have? The fact that we are here on this earthly plane to shine our loving heartlights for all to see and to connect with kindness to others? 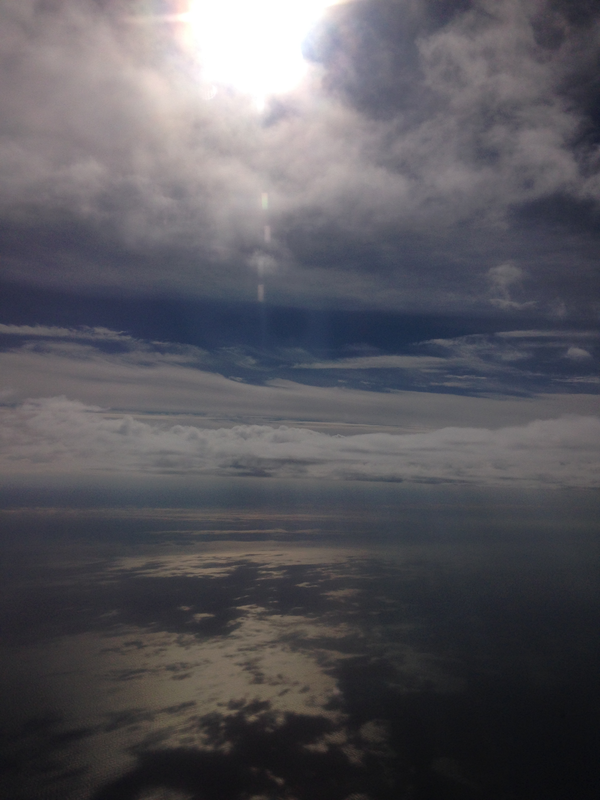 Come fly with me ~ our heartlights can shine together! Sing along with Frank and me below! all is well in our world. Sky-filled with angelic clouds was how I was greeted the other morning. Luckily before the winds moved the clouds too far, I was able to get a photo of what I deem a sky filled with angels, just waiting for me to notice them. What do you think? 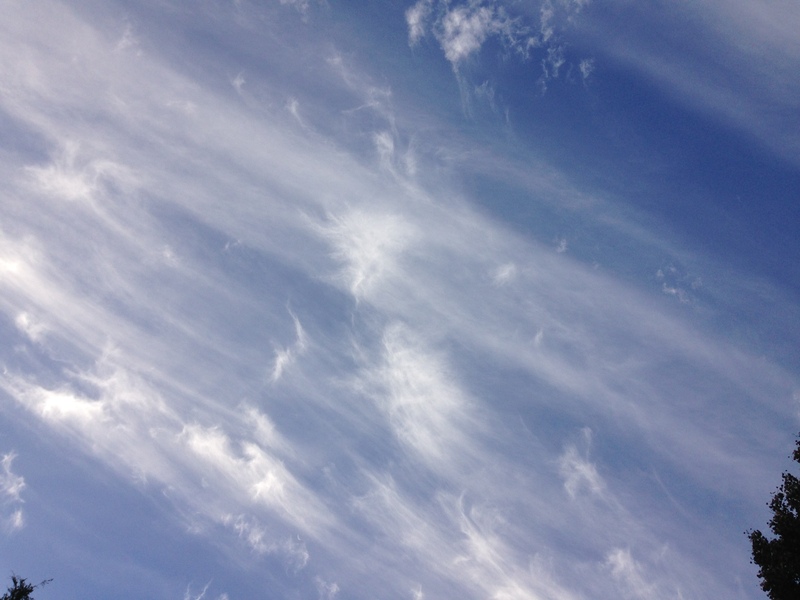 Do the cloud formations look like angels to you? Or is it just me? Can you see the angels gliding through the sky with your imagination? Do you even believe in angels? I do believe in angels and in spiritual encounters. I myself, have dreamed that I died and went to Heaven and told you about it in a previous blog post here. So for me, it was a natural assumption that these were angelic clouds reminding me of the peace in my life, the blessings that are mine by Divine Right and the fact that I am grateful every single day to be here with you. Lately I’ve been having dreams that include my Dad (who’s passed) and a few others who have passed as well. I am thinking that perhaps their presence in my dreams is actually them visiting me, to give me a message that they are still with me. But then again, maybe it’s simply my mind processing new information or going back to kind memories. The funny thing is that all those who have passed, when they are in my dreams, they are not how I remembered them at the end. Instead, in my dreams, they are vibrant, young and happy. How wonderful is that! Have you ever had any angelic experiences? Please share as I love to read them! I hope and pray you have a lovely, peaceful Sunday ~ that you find gratitude in the smallest of blessings in your life and that you cherish and love those around you for kindness and a loving heart expand the heartlight of the Universe which we are all a part of today. How Much Love Do You Put Into What You Do? I’ve always thought of kindness and good deeds to be highly regarded, but as I’ve grown older, I find that putting love into everything we do is just as, or perhaps even more important. 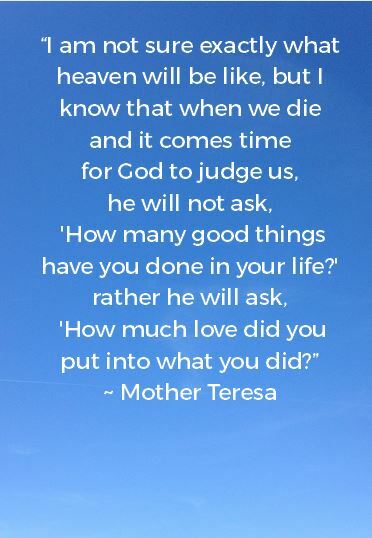 It was refreshing to find Mother Teresa’s quote today to confirm that someone else thinks the same as I do. Isn’t that always the way? We find comfort in connecting with others? It’s the simple things my friends. Love, kindness, gratitude, forgiveness, peace. Being the best we can be in all aspects of our lives. Living spherically, listening to others with an open heart to all they say and omit. Compassionately communicating to help, not harm. Stepping back when it does not serve you or others to jump into the fray in whatever form. Stepping up with courageous kindness when it does serve you and others. Not being afraid to speak the truth in a kind way. To listen, to be heard, to connect. To add love in all you do. To be a role model and shine your heartlight. To enjoy The Presents of Presence. Today, try to infuse love into whatever you are doing. Slow down and be present, be the present of love. Share a smile, a hug and a “I love you” with someone you cherish. Really feel the loving connection and be grateful. Use your beaming heartlight for good.